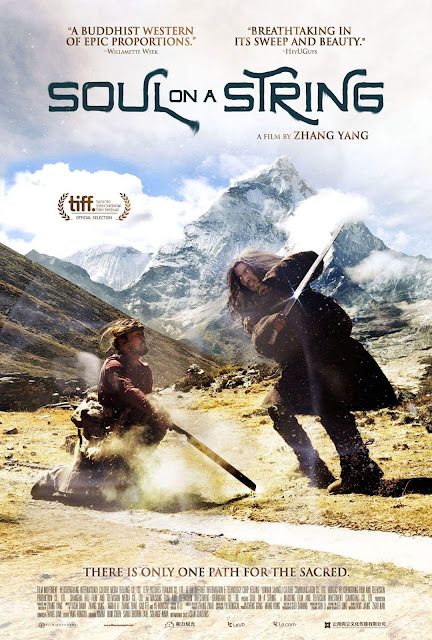 Zhang Yang's Soul on a String is the second film to issue from his close encounter with Tibetan culture. Adapted from two novels by Tibetan writer Tashi Dawa, Soul on a String takes a unique approach to classic narrative structure, even as it spins a Western-style tale of revenge and redemption far from the stark, spiritual minimalism of Zhang's previous film. A killer named Tabei (Kimba) is on the run from two brothers, Kodi (Lei Chen) and Guori (Zerong Dages), who have been seeking vengeance ever since their father was killed by Tabei's father. The pursuit is interrupted by mystical events: Tabei finds a magic Dzi bead inside a dead deer's mouth, and is subsequently struck — and killed — by lightning. But he is called back from the land of the dead by the prayers of a living Buddha (Mima) in order that he might take the precious holy stone to Palm Print Mountain, the sacred home of the Lotus Master. Now Tabei is pursued by black market traders, who know that the Dzi bead is a priceless antique. Also hot on his heels is a writer (Siano Dudiom Zahi) who seems to be living in the future; he's actually writing Tabei's story, and is in search of an ending. Tabei's journey to Palm Print Mountain will be an amazing adventure of self-discovery, soul cleansing, and fateful encounters. The movie plays from 2:00 to 4:30 pm in Classroom A, and is free and open to the public. The library is located at 4400 Forbes Ave. (map). Pittsburgh Ginkgo Fest, November 4. Nine decades of Chinese food in Squirrel Hill. CMU K-Pop Dance Club K-BBQ Social, October 19. Rapper G Yamazawa at Pitt, October 21. Chuseok Korean Fall Festival at Pitt, October 15. Bae Bae's Kitchen opens downtown.